The 295mm European wire fan guard protects cabinet cooling fans from damage by foreign objects or fingers. Our wire fan guards allow more airflow than mesh fan guards and perforated metal fan guards. This fan guard is manufactured with heavy duty steel and is plated with silver powder coating to keep the fan guard in top condition. 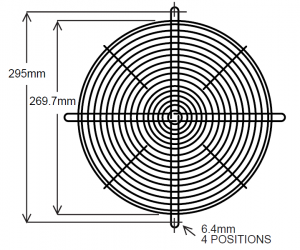 The ring and rib diameter measure 2.4mm. GardTec sells wire fan guards in bulk for extra savings on cabinet cooling fan accessories.